For the surface, the 'copy labels' approach is available (see http://support.brainvoyager.com/surface-space/42-cortex-based-alignment/246-how-to-use-the-copy-labels-approach.html). 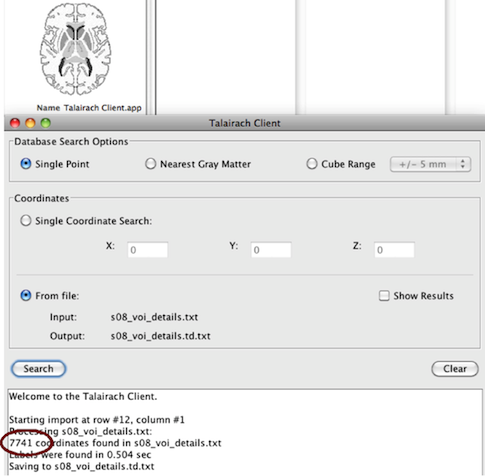 For finding names of regions of interest (VOIs) in volumetric data, one of the options is to use the Talairach Daemon. In the text below is described how to obtain summarized results. 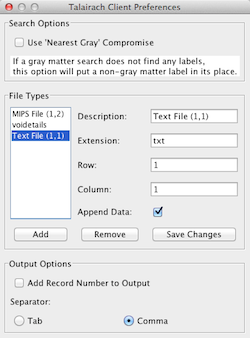 New per 08-11-2012: update to batch version (v2) for processing a number of coordinate label files at once. 2. Download the client from: http://www.talairach.org/client.html. 3. Run the Talairach client with options 'Single point', 'From file' and 'Show results' (see figure below); load the file, indicating the start at the 12th line (if using VOI details directly). After clicking the 'Search' button, register the number of coordinates found. An example is included in with the zip file below in (6). 6. 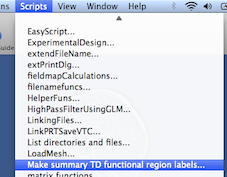 Copy the 'Make_summary_TD_functional_region_labels_v2.zip(js)' script to /Documents/BVQXExtensions/Scripts/ and adapt the first line (file including path name of *.td filenames). 7. Start BrainVoyager, run the script. 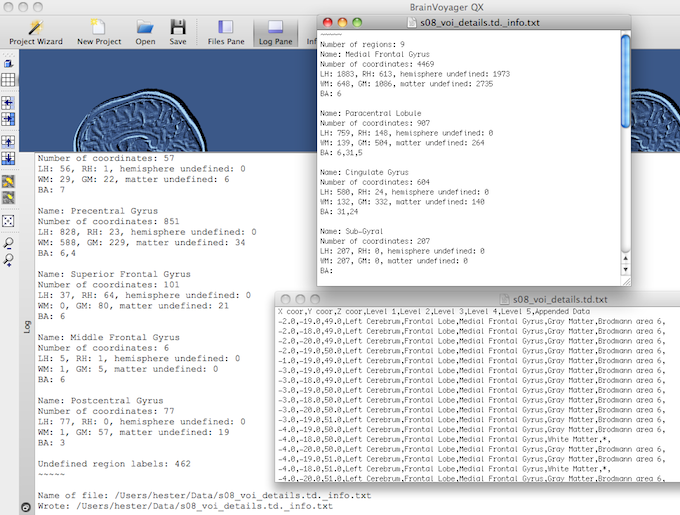 This will produce a text file with the number of voxels found per region for each *.td file. The information is also printed to the BrainVoyager QX Log tab (see screenshot below). v1 (for one *.td file): Copy the 'Make_summary_TD_functional_region_labels.js' script to /Documents/BVQXExtensions/Scripts/ and adapt the first 3 lines (path, coordinate file name and number of lines (take number of coordinates in VOI details or coordinates found by Talairach Daemon).